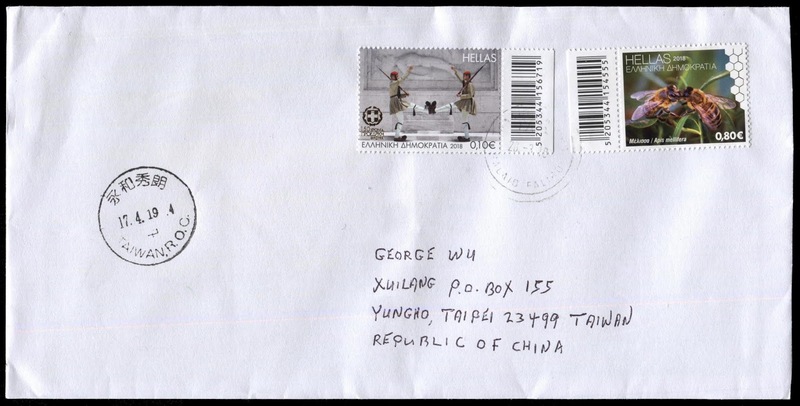 then I can clear identified and correct reply. 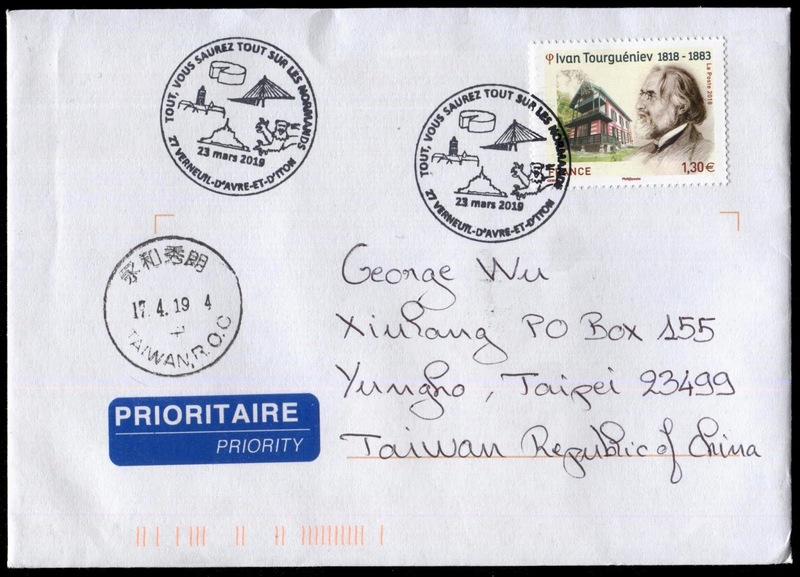 Kyrgyzstan Ivan Tourguenev FDC, posted on November 9, 2018 from Bishkek to Taipei with arrival postmarked on April 12, 2019. 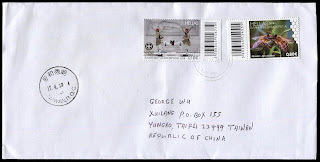 Thanks to Kyrgyz Express Post - Philatelic Bureau. Kyrgyzstan-Belarus diplomatic relation FDC, posted on October 18, 2018 from Bishkek to Taipei with arrival postmarked on April 12, 2019. 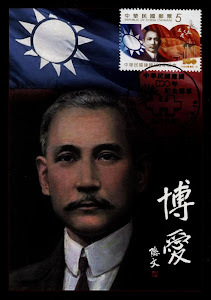 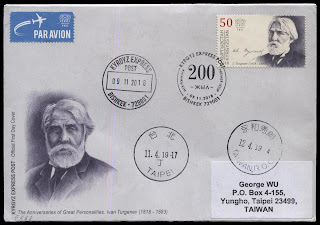 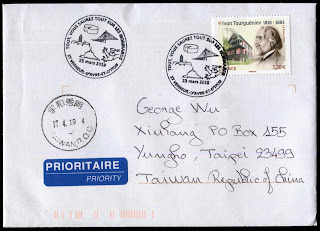 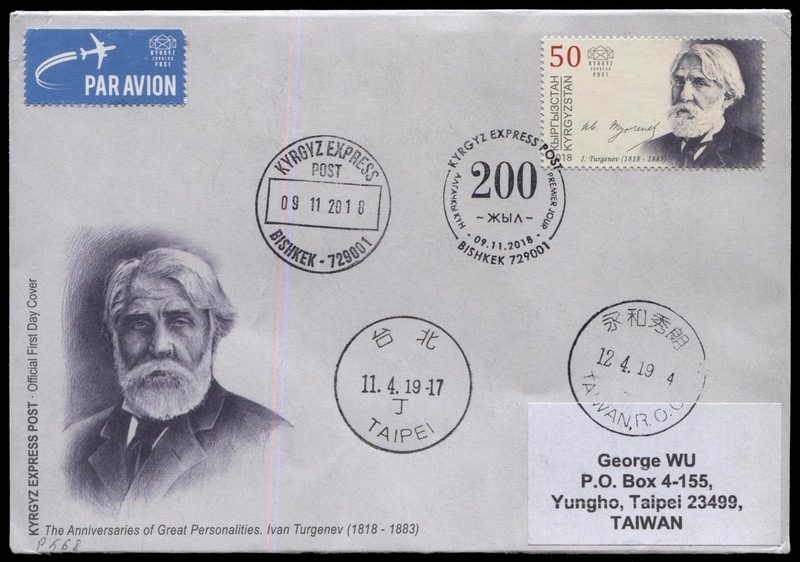 French Ivan Tourguenev cover, ppsted on March 23, 2019 from Verneuil-d'avre-et-d'iton to Taipei with arrival postmarked on April 17, 2019. 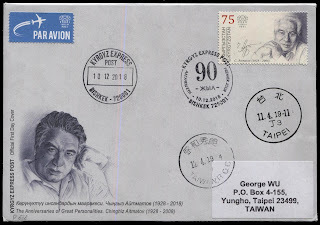 Greek honey bees cover, posred on March 28, 2019 from Alimos to Taipei with arrival postmarked on April 17, 2019. Kyrgyzstan-Latvia diplomatic relations FDC, posted on October 5, 2018 from Bishkek to Taipei with arrival postmarked on April 12, 2019. 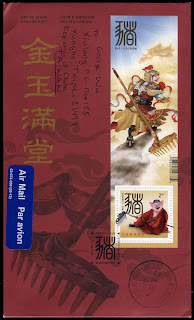 Indonesian 2019 New Year - Year of Pig (Tahun Babi) FDC, posted on January 28, 2019 from Bandung to Taipei with arrival postmarked on April 16, 2019. 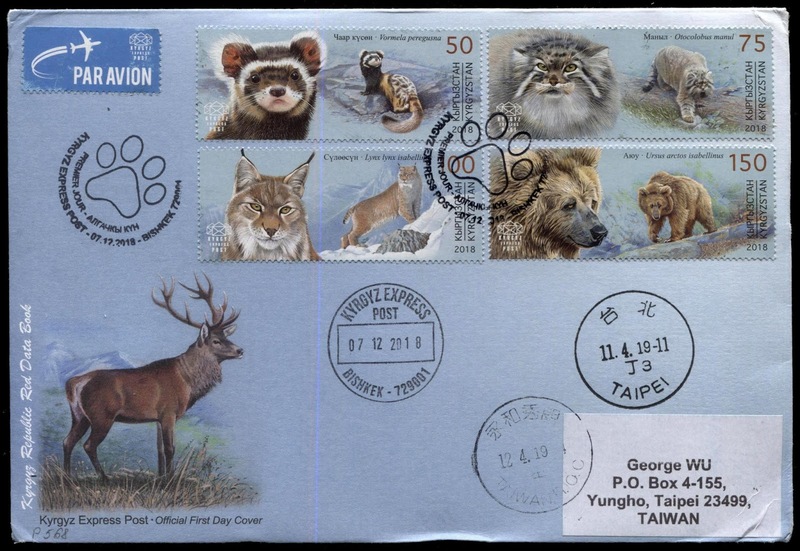 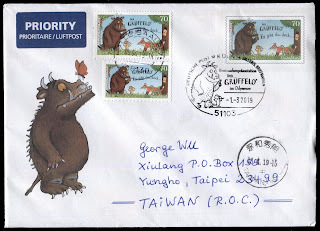 Germany Gruffelo cover, posted on April 5, 2019 from Halle/Saale to Taipei with arrival postmarked on April 16, 2019. 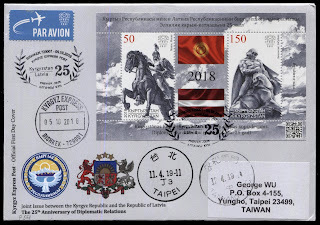 Kyrgyzstan Red Data Book FDC, posted on December 7, 2018 from Bishkek to Taipei with arrival postmarked on April 12, 2019. 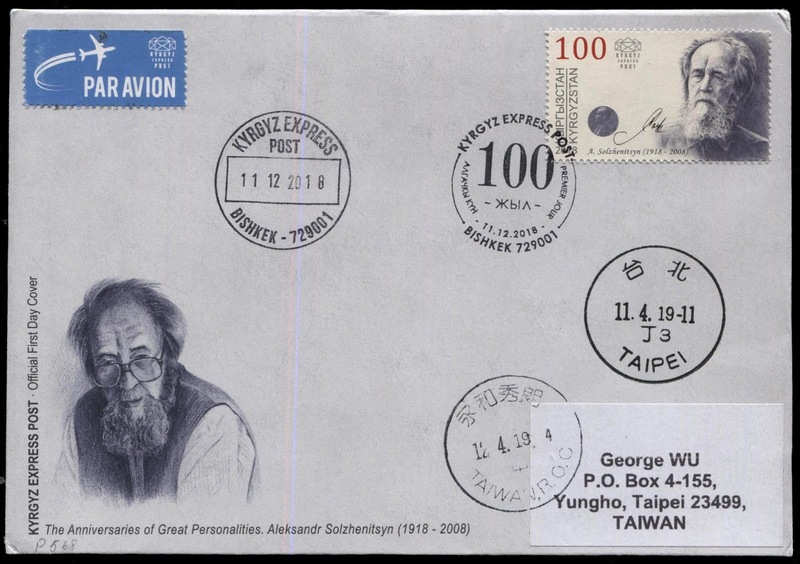 Kyrgyzstan Alexandr Solzhenitsyn FDC, posted on December 11, 2018 from Bishkek to Taipei with arrival postmarked on April 22, 2019. 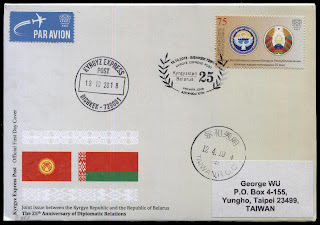 Thanks to Kyrgyz Express Post Philatelic Bureau. Kyrgyzstan Chinghiz Aitmatov FDC, posted on December 10, 2018 from Bishkek to Taipei with arrival postmarked on April 12, 2019. 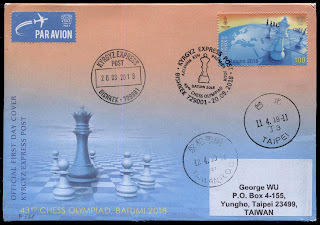 Kyrgyzstan 2018 Chess Olympiad FDC, posted on August 20, 2018 from Bishkek to Taipei with arrival postmarked on April 12, 2019. Canada 2019 Chinese Lunar New Year - Year of Pig FDC, posted on January 18, 2019 from Toronto to Taipei with arrival postmarked on April 12, 2019. Please kindly help me to taking some nice photos, about all your local postal letter box, post office buildings, and ATM postage labels vending machines, please direct email all the digital pictures to me, all the pictures will displaying on this blog, Thanks.